William Orville 'Lefty' Frizzell (March 31, 1928 ? July 19, 1975) was an American country music singer-songwriter of the 1950s and a leading exponent of the honky tonk style of country music. His relaxed style of singing was a major influence on later stars Merle Haggard and Willie Nelson. Frizzell was born in Corsicana, Texas, but moved with his family shortly after his birth to El Dorado, Arkansas, where they remained until the early 1940s. Frizzell began playing the guitar as a very young boy and by age 12, he was appearing regularly on a children's show at a local radio station KELD. Frizzell was born in Corsicana, Texas, but moved with his family shortly after his birth to El Dorado, Arkansas, where they remained until the early 1940s. Frizzell began playing the guitar as a very young boy and by age 12, he was appearing regularly on a children's show at a local radio station KELD. The family moved back to Texas when Frizzell was still a teenager, and his music career got a boost when he won a talent contest in Dallas. In his late teens, he was performing at fairgrounds and other venues, developing a unique, soulful voice. Like his father, he got work in the oilfields, but his growing popularity as a singer soon gave him regular work on the honky tonk nightclub circuit. At age 19, he had a half-hour show on a small Texas radio station, getting a big break when a record producer heard him sing. Signed to Columbia Records, he immediately had a string of hits that broke into country music's top ten; several of them reached # 1. In 1950 , he was invited to perform at the Grand Ole Opry; the following year he appeared on the prestigious Louisiana Hayride radio program that broadcast from Shreveport, Louisiana and then began touring with country music's biggest star of the era, Hank Williams. A prolific songwriter, Frizzell had four songs in the country top ten at the same time in 1951 ? a feat that would not be repeated on any chart until The Beatles accomplished it on the pop charts, with five songs in 1964. 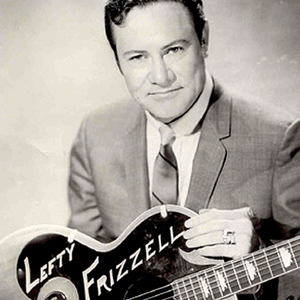 By the end of the 1950s, rock and roll was dominating the North American music scene, but although no one would ever mistake Frizzell's music for anything but country, his 1959 hit, " Long Black Veil," gained wide acceptance with a variety of music fans in addition to country, and was the first recording of this "standard." A few years later, Frizzell recorded " Saginaw, Michigan," which took the #1 spot on the country music charts and broke into the pop charts as well. The song earned him a Grammy Award nomination. In the early 1970s, Frizzell changed record labels and moved to Bakersfield, California, where he recorded several more country music hits and became the first country singer to perform at the Hollywood Bowl. By then, however, his problems with alcoholism were already taking their toll. Mood swings and outbreaks of irrational anger became a trademark, and his constant failure to meet recording commitments strained his relationship with his recording company. In 1972, Lefty Frizzell was inducted into the Nashville Songwriters Hall of Fame and his song "If You've Got the Money, I've Got the Time" earned him a Grammy Hall of Fame Award. Unfortunately, success and money only added to Frizzell's alcohol addiction, and on July 19, 1975, he suffered a massive stroke and died at age 47. He was buried on "Music Row" at Forest Lawn Memorial Gardens in Goodlettsville, Tennessee.